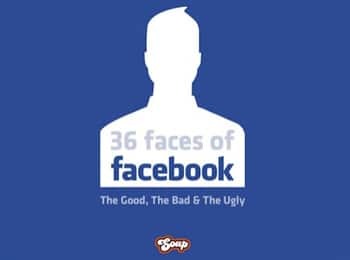 L’agence créative Soap vient de publier un SlideShow appelé ’36 Faces of Facebook Fans: The Good, The Bad, and The Ugly ». Un regard sur les différents types de fan sur facebook. « Like any large ecosystem, Facebook’s billion-strong audience presents a fascinating glimpse into the sheer variety of fans that swarm to brand pages like African fauna around a watering hole. While many are relatively benign, and some are downright pleasant, there do exist various types that have the potential to drive one to drink. Come now as we draw back the curtain on Facebook fans and examine the good, the bad and the ugly of social media.